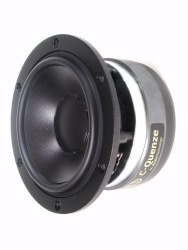 The 15H 52 06 13 SDK is a mid-woofer from the AudioTechnology C-Quenze series. The best part of energy during development was put into refinement of the performance in the midrange area. All the materials used, were picked to obtain the trustworthiest midrange reproduction. The drivers are extremely fast and move without any dynamic compression due to the mechanical construction. 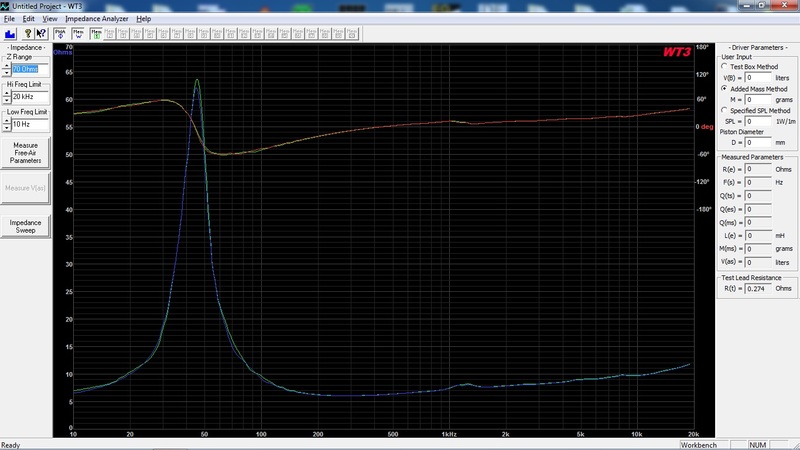 Customers are able to make adjustments regarding the T/S parameters as well as the physical parameters – FX. Voice coil winding height, magnetic gap height and magnet sizes. This is an unique possibility for DIY:ers. The features such as: SD system, Kapton voice-coil former and under-hung motor structure is available in the C-Quenze drivers. Hexacoil voice coil winding technique is used. The high ventilation factor through the centre pole piece, under the rear suspension and the perforation to the voice coil, are naturally kept intact, enabling the moving system to accelerate without any compression. Note! The drivers measured and used here are a custom built driver (“SDK” version) with an under-hung voice-coil made of Kapton. Drivers with Kapton voice-coil former often perform a more detailed midrange with higher dynamic and less coloration and distortion. T/S parametrs are measured both when the driver unit are cold and when warmed up with a 1 hour stress stimulus at 5.66V (4W/8Ω). The warmed up driver units are rested for 2-3 minutes before they are measured. The samples are an almost perfect match between each other. Some sort of resonance is visible at 1250Hz. Very low inductance. 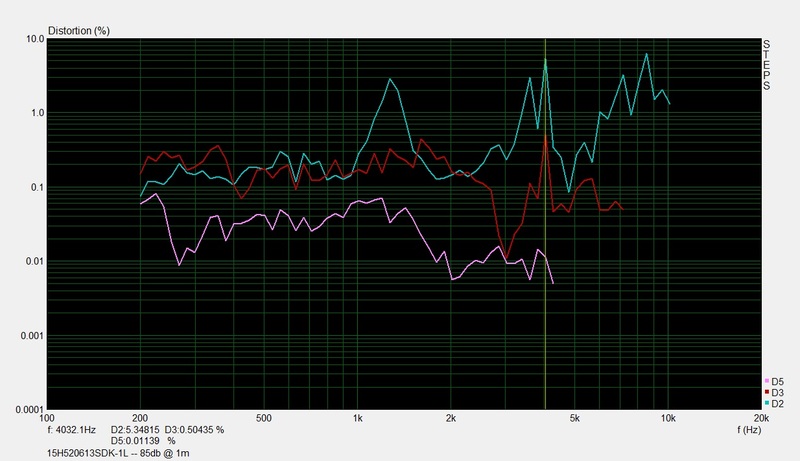 The Fs is lowered by 3Hz, but otherwise they have the same response curve as the “cold” driver units. Driver position: Mounted on center-line with driver unit center 22,2cm from the top of the baffle. Nice consistency between the two driver unit samples. A sharp dip at 1250Hz most likely caused by some sort of cone-edge resonance. Very smooth frequency response between 1.5 -4kHz and with a rising top-end. 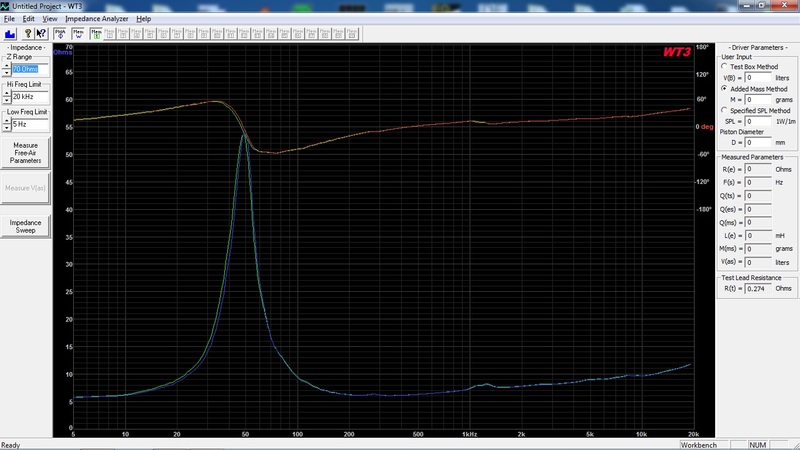 The distortion measurements are done in near-field and the amplifier output level was adjusted for each driver so that the fundamental is 85dB at 1m and 90dB at 1m. This setting simulates normal to medium-high listening levels. A harmless second-order harmonic spike at 1250Hz due to the cone-edge resonance. Very low odd-order harmonics within the mid-woofers usable frequency range. This driver should be able to cross as high as 3-3.5kHz.